As part of an exhibition marking the 250th anniversary of William Hogarth's death and featuring work by David Hockney, Yinka Shonibare MBE and Grayson Perry, Jessie Brennan is exhibiting a series of newly commissioned drawings of the soon to be demolished Robin Hood Gardens in Poplar. She talks about the project. London-based artist Jessie Brennan‘s drawing and moving image practice explores the social history of places and the individuals who occupy them. 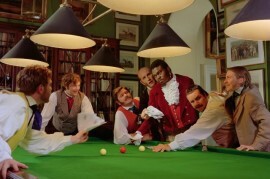 She has recently been commissioned by the Foundling Museum in London to create a work in response to William Hogarth’s A Rake’s Progress, to be shown alongside the artist’s original 1735 prints and three other contemporary takes on the series – David Hockney’s A Rake’s Progress, Yinka Shonibare’s Diary of a Victorian Dandy, and Grayson Perry’s The Vanity of Small Differences. The exhibition, Progress, which opens on 6 June, marks the 250th anniversary of Hogarth’s death as well as the Foundling Museum’s 10th birthday. It celebrates Hogarth’s legacy as a painter, satirist and founding governor of the Foundling Hospital Art Collection, and the continuing popularity and relevance of arguably the most famous of his ‘modern moral tales’. Brennan’s new work, a series of four aluminium-framed pencil drawings titled A Fall of Ordinariness and Light, takes Robin Hood Gardens in Poplar, East London as its starting point, a Brutalist social housing estate designed by Peter and Alison Smithson in the late 1960s, and now due to be demolished. 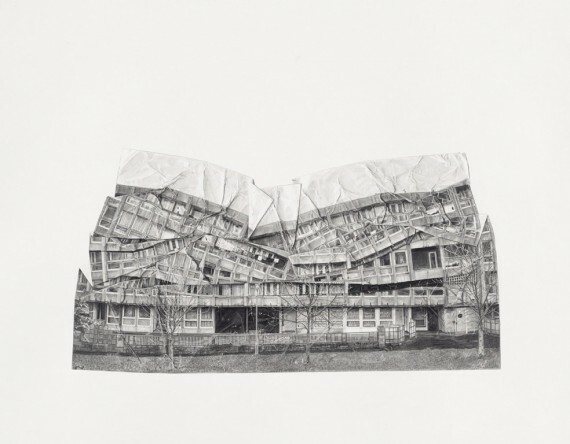 The work depicts, in intricately worked graphite on paper, collaged photographs of the estate’s façades that have been crumpled and then unfolded. The resulting crinkles and creases cut across the building’s geometric form, disrupting the order and regularity of the modular block and powerfully envisioning its implosion. Resembling discarded blueprints – drawings rescued from a planner’s waste paper basket perhaps – the series also reminds us of the disconnect between an architect’s vision and the actuality of lived experience. Traces of the estate’s inhabitants can be glimpsed within the illusory folds of paper – washing hanging on a balcony, potted plants in a window – but people remain poignantly absent. Brennan’s practice confronts the politics of contemporary urban living, the impact of regeneration on people and places – in this case the London borough of Tower Hamlets, where Brennan also lives. The new work borrows its main title from the Smithsons’ 1970 publication Ordinariness and Light, which laid out the couple’s architectural theories and political concerns; its four subtitles – The Order Land; The Scheme; The Enabling Power; The Justification – are taken from the Compulsory Purchase Order issued by Tower Hamlets Council in 2013 when acquiring the land around Robin Hood Gardens as part of a redevelopment project. 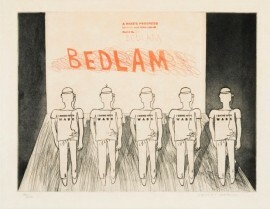 Brennan’s social commentary, her eye for detail and her use of the sequential form connects her work to Hogarth’s and in turn to the other artists in the show. But in its enlightened decision to commission work from an emerging, female artist, the Foundling Museum not only extends the Foundling Hospital’s original charitable activities – “Hogarth invited Thomas Gainsborough to exhibit alongside leading artists of the time when he was just 21 years old,” Brennan tells me – it brings a fresh perspective to the creative conversation. A young, female voice alongside four male art-world ‘giants’, Brennan’s is a welcome counterbalance, and offers a timely critique of London’s development policies – of which Hogarth would surely have approved.